Superb Victorian London 1893 hallmarked silver gilt mounted and marble lidded jar by GEORGE BETJEMANN AND SONS, famous makers of fancy goods. London 1893 English hallmarked solid silver and marble unique lidded jar by famous maker George Betjemann and Sons, the inventors of the tantalus, and the most famous maker of luxury fancy goods in the world during this era. 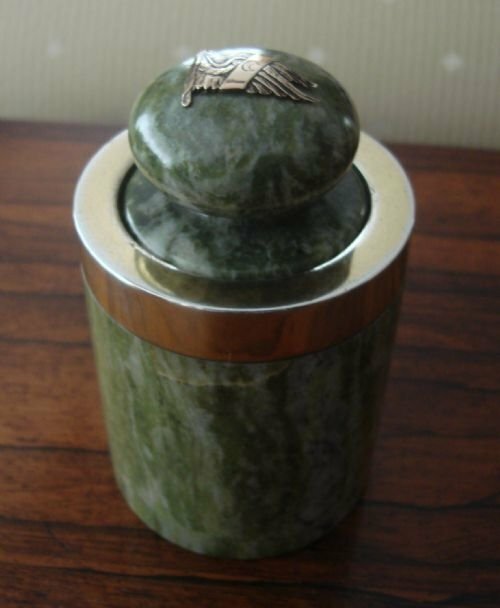 The beautifully veined green marble jar or canister is mounted with a silver gilt rim, with pale gilding, and a beautiful applied crest to the lid. The lid is perfectly fitted to the jar, and slides in as if on an air cushion. This was used by the previous owner as a tobacco jar, but is equally at home as a tea caddy or desk or dressing table tidy. It's weight also means it can double as a paper weight! Size-4.75 inches high by 2.75 inches diameter. It makes a wonderful presentation on desk or table, and is a very unusual piece. I have never seen another. It would have been an expensive piece at the time, probably made bespoke for a client. There is a small slice/chip on the underside of the base, only visible when the jar turned upside down, mentioned for accuracy. 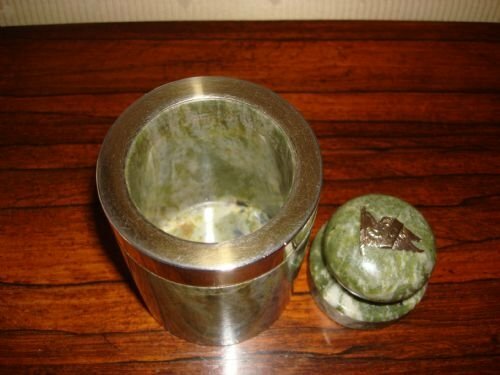 A really lovely and very decorative jar in very good condition overall, excellent for a pipe smoker, tea drinker, or novelty silver collector. 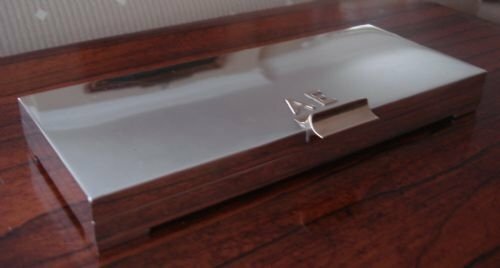 Sheffield 1957 very unusual solid silver combination letter opener and pen knife by famous makers MAPPIN AND WEBB. 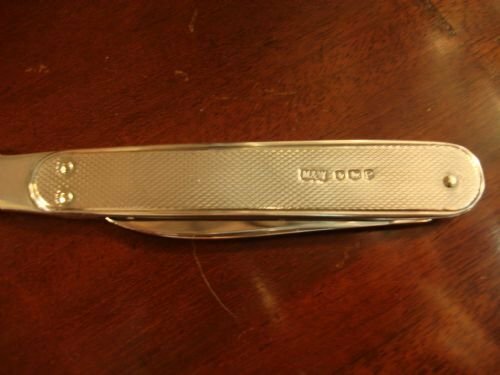 Sheffield 1957 English hallmarked solid silver very unusual combination letter opener and pen knife made by famous makers Mappin and Webb who are well known for excellent quality. 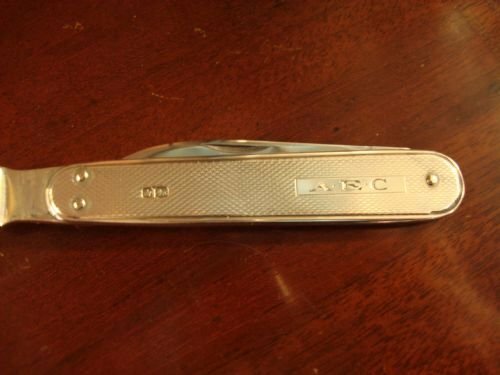 This lovely piece has an engine turned engraved knife portion having a stainless blade, and an angled long letter opener. One side of the knife bears the original owner's initials within a cartouche. The hallmarks are very clear. Size-9.25 inches long by .75 inches wide closed. An excellent and very functional gift, or a lovely piece to keep on a desk or table. With one line mark near the tip of the knife, this is in very good condition overall. Edwardian silver London 1907 hallmarked solid silver pen wipe and stand in the form of a stickstand, by JOHN COLLARD VICKERY, fine maker. 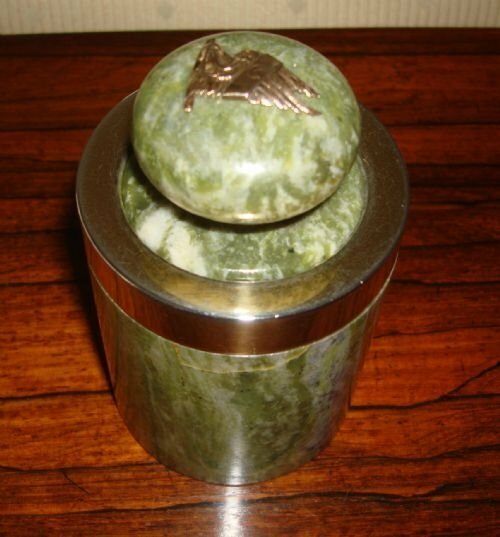 London 1907, English hallmarked solid silver pen wipe and stand designed in the form of a stick stand, by John Collard Vickery fine maker and retailer of "fancy goods." He headed a well known firm who made goods for many European royal families by appointment. Dipping pens are meant to stand upright, and their tips wiped of excess ink on the natural bristles prior to writing. The base of the stand is inset with the original badger bristles, and would also be an excellent stand to use to hold and display a collection of hat pins. Size 3.75 inches high, by 2 inches wide, by 1.25 inches deep. A rare piece with excellent weight and quality. It would look lovely on desk or table, or in a collection of novelty silver. 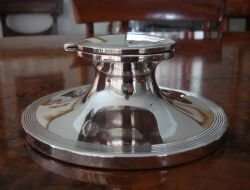 Sheffield 1936 very large and impressive solid silver capstan inkwell with reeded borders by very famous makers WALKER AND HALL. 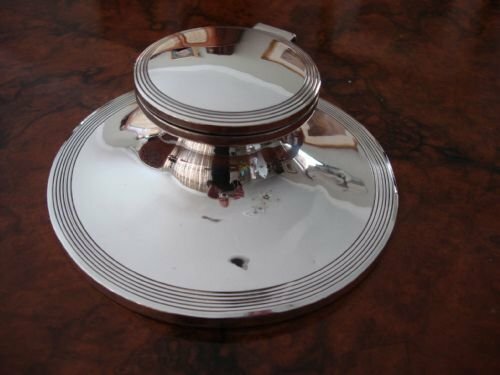 Sheffield 1936 elegant English hallmarked solid silver very large capstan inkwell with elegant reeded borders to lid and base edges, made by Walker and Hall, very fine makers. The hinged lid opens to reveal the heavy original glass liner. 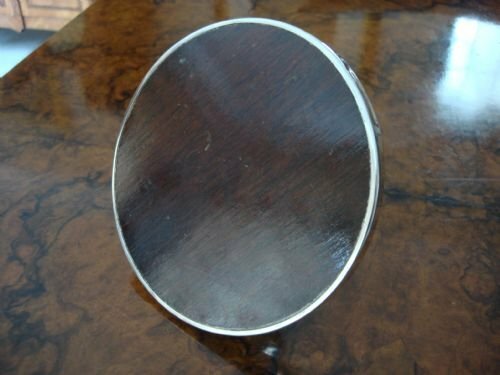 The base underneath is polished mahogany. Size-6 inches in diameter by 2.5 inches high. A very impressive and stylish piece for a desk or table, in classic form. With some minor bumps to base, this is a well presented impressive inkwell/inkstand, in very good condition overall. 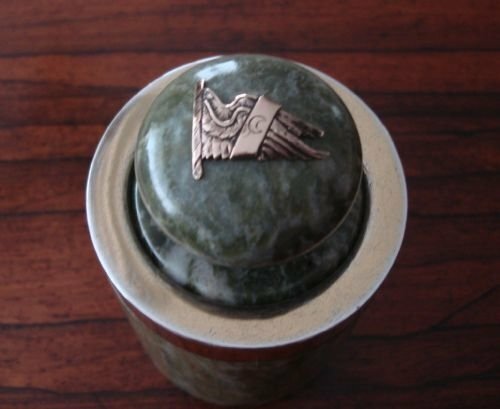 London 1966 superior quality English hallmarked heavy solid silver box, by famous makers MAPPIN AND WEBB. 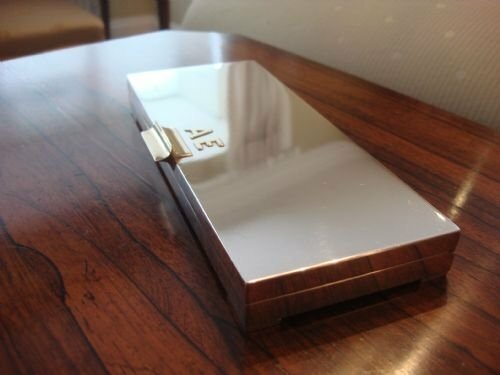 London 1966 very unusual and superior quality English hallmarked solid silver rectangular box with applied gold initials and thumb piece by very famous makers Mappin and Webb. Made in a very heavy gauge of silver, with full length piano hinge to top lid, and raised on stylish stepped feet. Size-8 inches wide by 3.25 inches deep, by 1 inch high. 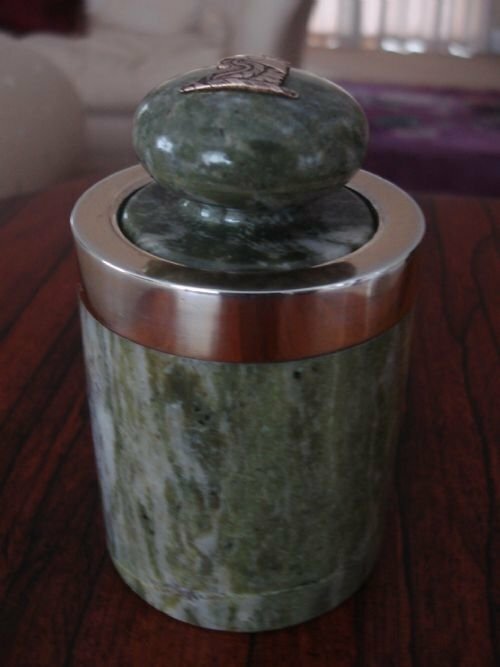 This is a superb desk or dressing table tidy to hold supplies or jewellery for either a man or woman. 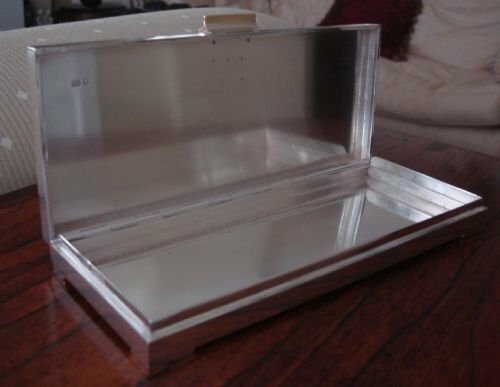 Very heavy and superbly crafted, it is a truly striking solid silver box which will look very impressive on desk or table. In very good condition, very stylish and functional, and made by famous makers. A truly stunning box, sure to impress when displayed on table, desk or dressing table. It would make a wonderful gift, or a treat for yourself. 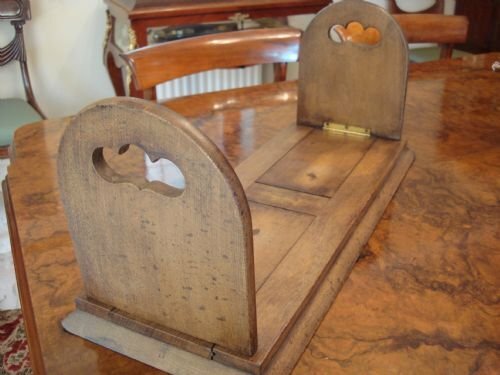 19thC Victorian figured walnut fall front fitted stationary box. 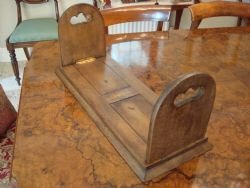 19th century Victorian figured walnut unusually shaped fall front fitted stationary casket, with silk lined interior, which includes stationary from the House of Lords. This box came from a large home in Sussex, where antiques had been collected for many years. It is in wonderful original condition, and comes with the original key. Size-11 inches wide by 3.25 inches deep by 5.75 inches high. Victorian very large and unusual English oak library expanding book slide by Charles Westerton of Knightsbridge. 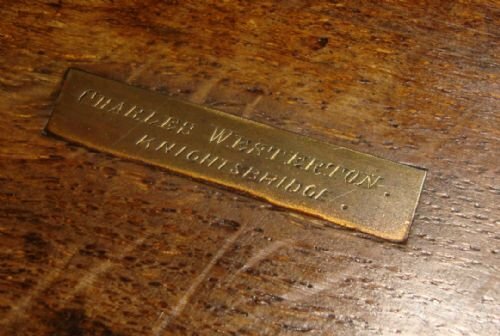 Victorian period very large solid oak library expanding book slide by Charles Westerton of Knightsbridge, London, and bearing his brass plaque label. Both arch topped ends with cut outs slide out to a long length, and fold flat on brass hinges. This book slide is much larger than the normal ones found, and will hold from small to large volumes. What a great addition to your desktop or shelf, to keep your library or reference books in order. Size-closed 22 inches long by 8.5 inches wide by 9.5 inches high. Fully open-35.5 inches long. Charles Westerton owned and ran the English and Foreign Library, from 1849, previously of Park Side, at No. 20 (later renumbered 27) St George's Place. This was set up to supply 'all classes of Readers . . . and at such a Low Subscription as to make it thoroughly a popular Establishment'. The annual fee was one guinea and by the late 1850s some 125,000 volumes were available. With very nice colour, this unusual book slide is in very good condition. 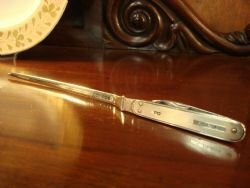 Birmingham 1905 stunning solid silver and ivory Art Nouveau paper knife or letter opener by Deakin and Francis, very good makers. 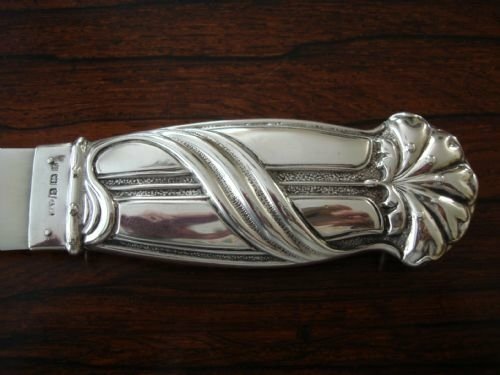 Birmingham 1905 beautiful English hallmarked Art Nouveau solid silver and ivory paper knife, letter opener or page turner, made by Deakin and Francis in a very aesthetic style of twisting bands over curved panels surmounted by a stylised shell. Textured sections accent the polished panels. Beautiful grain to the ivory, which is in perfect condition. Size-13 3/8 inches long by 1 3/8 inches wide. The silver portion is 3 7/8 inches long. Deakin and Francis is a fine well known firm that began in 1786 in Regent Street in London, and still remain family owned today. 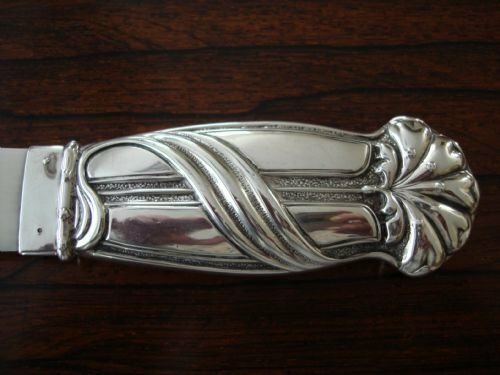 During this period, early in the 20th century, they made many Art Nouveau and Arts and Crafts aesthetic period silver items, which are as popular today as they were 100 years ago. They are most contemporary in style, and go with many periods of decoration. 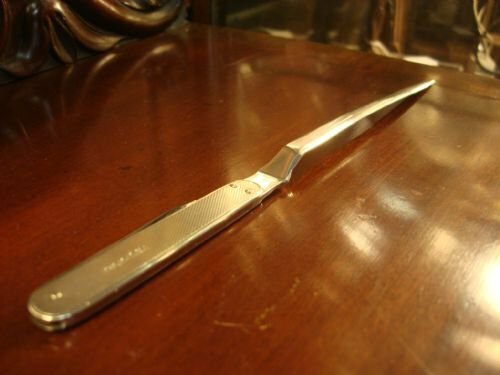 A lovely and functional example of an antique paper knife, page turner or letter opener, in very good condition. It is a beautiful piece for any desk or table. Birmingham 1902 solid silver and cut glass double inkstand. 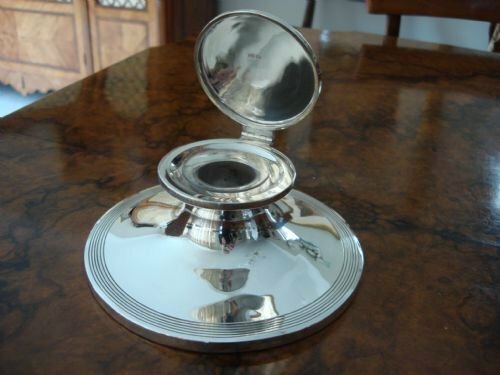 Birmingham 1902 solid English hallmarked silver and cut glass English hallmarked double inkstand/inkwell with pen rest. This came from the estate of Dr. Robin Osler Barnard, internationally famous neuropathologist. He died in 2005, was a descendant of the famous Osler glass family, and an avid collector of antiques. Size-4 3/8 inches long by 2 7/8 inches deep by 1 7/8 inches high. 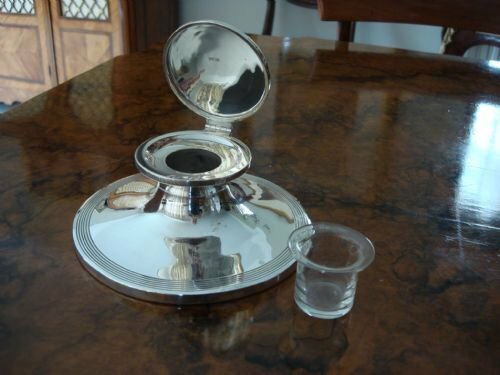 With gorgeous light catching facet cuts to entire base, bevelled edges to all corners, and very clear hallmarks, this inkstand is a lovely piece in excellent condition, with an interesting provenance. 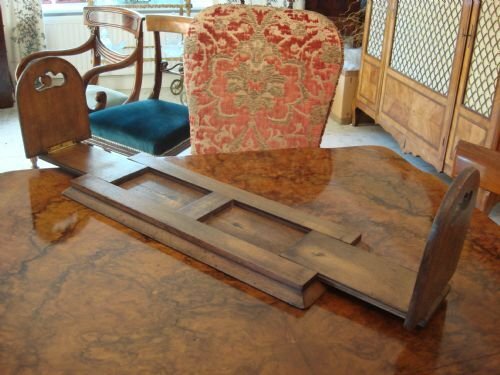 Lovely large 19th century solid mahogany writing slope with secret drawer, inkwells and original key. 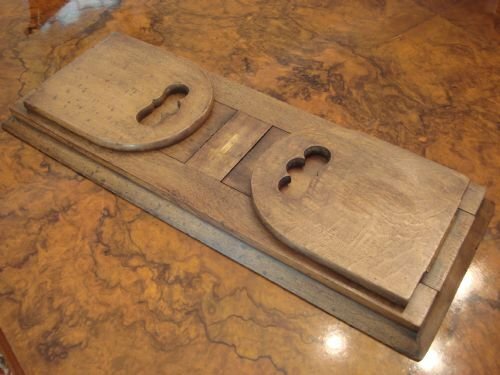 19th century large lovely solid mahogany writing slope having two brass side carry handles, a full length secret drawer to the side, original key, plus two brass topped locking inkwells and removable pen rest. The secret drawer can only be opened by first removing the original pin closure on the inside. The writing surface is a beautiful dark green velvet, and both halves hinge up to reveal storage underneath. The original brass stand hinges up on the side in three different positions to hold the slope open at an angle when only the pen rest and ink wells need to be reached. Size closed-20 inches long by 9.75 inches deep by 6 inches high. This is a lovely complete writing box for the collector, or a great decorative piece to use in any room. With lovely colour and patination, it is all in very good condition.